But it's have no life and also have a connection that doesn't screw up at least twice a day for five minutes. The balls challenge from LoL was a very good endurance challenge. Yeah, endurance challenges where it's legitimately difficult to do what you're supposed to are good. Spending 16 hours straight at a computer doing a stupid survivor challenge is ridiculous. The game should never demand that from anyone. I just hit a point where my thought process was "control-v submit scroll down next tab control-v submit scroll down next tab..." and really didn't think of anything else (except as time passed I began to think more of the carpal tunnel that was developing in my left hand). The only reason I fell where I did was that I was trying to figure out a way to keep going without murdering my left hand and took too long doing so. We should start calling Def "Keith"
That'll go in the tips post when I'm not at work. The flip side of this is that it's also easier to start out playing too aggressively, then learning to pull it back than it is to try to wean yourself onto the "right" amount of aggression. This also applies to, like, any game/activity. I don't think it's possible for me to be "too aggressive" on anything. Overplaying teaches you a lot more than underplaying. If you go over the top, try whatever ideas pop into your head and possibly get voted out as a result, you'll learn what does and doesn't work much more quickly than by just sitting around watching people do their own things. It's horrifying though. Especially when games only happen once a month at the fastest. That's a long time to wait to try something risky and then get voted out and have to wait. I don't know, I learned that sitting around just doing challenges and not talking wasn't any good after my first game. Although that might have also been the two years I took thinking about what went wrong. I do notice that when I Try to do something different, I end up reverting back to my old play style. There was this one time I tried out being less aggressive and idol-hunting quietly instead of being myself. That certainly had an affect. Something I would recommend as practice to address Chevre's point, there are always smaller/less serious Mish Mash games going on that take less time. Playing Allocation, Nominations, and Behind the Masks helped me practice a lot in a short time and involved a ton of social interaction. Non-Anon games do require you to put some effort in making sure you're connected to -someone- of course or you won't be trying things out for very long. In post 93, DeathNote wrote: I do notice that when I Try to do something different, I end up reverting back to my old play style. I don't think it's possible to actually pivot too far from your playstyle. How you play Survivor is just super tied to who you are as a person, and a lot of it is trying to make your personality work within the game. I've never really had an issue with this, but maybe that's just due to my particular brand of identity issues. I think it's true to say that how you perceive things won't generally change when you're playing survivor, but how you choose to react to them, especially in the anonymous format which requires PMing, it gives you a lot of time to think. To decide who you're going to be. 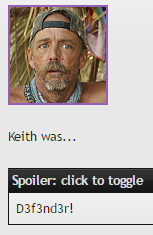 I... have a weird mental block of the 2 survivor games I played back in 2010/2011, I can't seem to remember doing them at all.... which isn't all that surprising if I think about the timeline. However, the 1 offsite game and 2 MS games I've played I think it can be argued I've played a very very different game in each of. In Survivor: Hogwarts (offsite) I won by being completely ruthless. I encouraged people to throw challenges, I lied directly to people's faces and didn't give a damn, and I convinced 2 players who had found idols on their own to Give them to me. I had 2 HIIs and found 0. At FTC I played up how I had fit all categories of the game. I'd won the most individual challenges, I'd manipulated people and I'd used both my idols at key times to ensure the game went in my favour after starting out on the bottom on my original tribe's alliance. I also had to answer to like 4 people who were all really pissed that I'd lied right to their faces and put the knife in them, and I managed to get 2 of the 4 of them to vote for me I think? I won 5-4-0 so, it was close but being ruthless paid off. In BotB, I played as a newbie. For all intents and purposes I was one, at least to MS survivor games (as far as I knew at the time anyway). I game botted through the game, played in huge bursts and made myself an undesirable target once we hit merge. I made a mistake at final 5 by not being as ruthless as I was before. I wanted to stick to my alliance, even though I was still willing to cut people prior. I should have known to read the situation and change my plans but I didn't and I paid for it. But this was a way more low key game than the one I played in Hogwarts. I was also an extremely emotional player, and let my emotions show on my sleeves. And then in Magical Kingdom, I played in some ways similar to BotB but I made a very clear stance at the beginning of that game. When I made a vow, it was kept. And people had to play around that, and it worked really well because people knew from experience that I was treating promises and binding contracts. I made a public spectacle of my deal with Haschel regarding the HoH round, and it kind of worked from there. In the end some bad luck and my desire to stick to promises killed me, because I should have tried to vote out Bella instead of Shadoweh, but I had promised her a while back that if we ever ended up in that situation, I'd focus on her and not Bella. It's right to say that in each I have an undercurrent of being an emotional player, but it's wrong to say that my style was limited in any way by that. I played 3 very different games with 3 very different sets of principles regarding loyalty and how I approached votes. I think that it's possible for anyone to vary this because it depends on the decisions you make, as opposed to the way you are and feel. Which is why I say the best advice is "be aggressive" because you can always switch up and tone it down. But it's so hard to tone it back up and make it seem real. Make a plan and stick to it. In post 96, Lady Lambdadelta wrote: I've never really had an issue with this, but maybe that's just due to my particular brand of identity issues. I think this may help you out a bit in terms of controlling who you are in games? Like I have absolutely no ability to play outside of my personality. I may also be the other extreme, though, since I also seem to be easier-than-average to ID in games (although n for this is, like, effectively 1). Being easy to ID is a bad thing and goes against the spirit of anonymous games.